These little pies sound delicious. I will definitely give them a try. Oh yum Anne! I would love one of these little cuties!! I've made spanakopita lots of times and really like working with phyllo. Can't wait to give these a try. Sounds delicious. Relatively easy too. Thanks for sharing. What a fun twist on apple pie! I love the plate that it is sitting on too! Ooo, phyllo apples pies sound fantastic! I usually avoid phyllo because keeping it moist is always a real pain for me. I know, I know, it's not that hard, but for some reason, I always dry the stuff out. But I think I could totally handle these little pies. How fabulously delicious! I'm sure your bro was super happy. Your story about your brother made me laugh. I felt that way about curry when I came back from a trip to India. 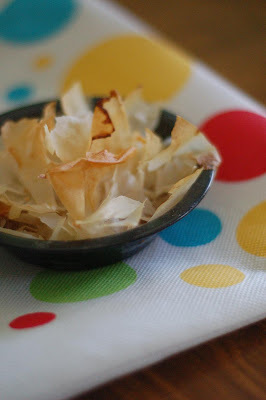 Phyllo is real easy to work with, just make sure you buy from a store with a high turnover = fresh. Have a peek in my site for the best Spanakopita you've ever had...guaranteed! Awesome! 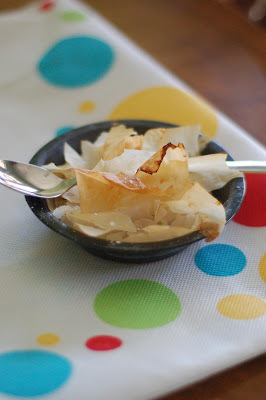 I love phyllo and I love apple pie and these look light a great LIGHT dessert! Where do you get all your cute mini dishes?